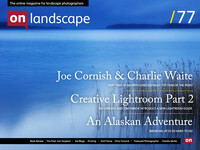 Part 2 of our interview of Joe Cornish & Charlie Waite by Steve Watkins (editor of Outdoor Photography). Steve: What I’d like to discuss is landscape photography in its broadest sense, but also look at some of the practice of landscape photography and what influences Joe and Charlie have had. I’d also like to touch on the future and where it is all going, because by the time we leave here, landscape photography will have changed, with another 20,000 photographs uploaded to Flickr. It’s changing before our eyes, and not necessarily all for the good. We have had some questions emailed in from various people, and we’ll kick off with them and questions we have had from the audience.